Hello lovelies! Sorry that I've been MIA from my blog for a couple weeks, I had my Uni exams which are thankfully over now (along with Uni), so I have all the time in the world to dedicate to my blog, yay! 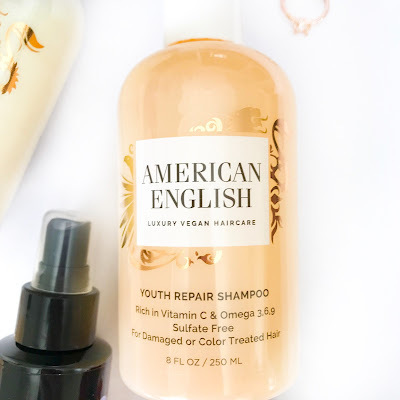 In today's post I'm introducing you to a luxury, vegan haircare brand called American English. I don't know about you, but I've been seeing this brand allll over Instagram, so I was super excited when I was given the chance to try out some of their products, and let me tell you, they definitely live up to the hype! I was sent 4 of their cult products: the Youth Repair Shampoo, Youth Repair Conditioner, Multivitamin Nourishing Spray, and the Seaberry Dry Oil. First of all, can we talk about how gorgeous the packaging is of all these products? I'm always a sucker for pretty packaging, so of course I'm in love with how luxurious these products look. I also love the fact that all their products are vegan, as I don't think I've ever heard of any other vegan hair products on the market! This shampoo is formulated for damaged or colour treated hair, so it's perfect if you use heat often on your hair, like me. It has a gorgeous, refreshing citrus scent, and I absolutely love how clean it makes my hair after just one use! My hair feels squeaky clean as soon as I've lathered this into my hair, which is perfect especially on days when I've been wearing a lot of dry shampoo. My mum has coloured hair and she gave this a go too, and said the exact same thing! Again, this conditioner is formulated for damaged and colour treated hair, and has the same beautiful citrus scent! It claims to get rid of frizz and restore strength and elasticity, which is perfect for my hair which is always super frizzy before I blow-dry and straighten it! I definitely felt that my hair was a lot smoother and softer than usual after using this, and it made my hair super easy to brush through. My all-time favourite hair essential is a heat protecting/nourishing spray to apply before blow drying or straightening, as it's so important to keep your hair protected from heat damage and crazy split ends! This Multivitamin spray has probably become my favourite one of all time! A good few spritzes of this and my hair is left feeling super silky and smooth, and it is well and truly protected from heat up to 425 degrees. 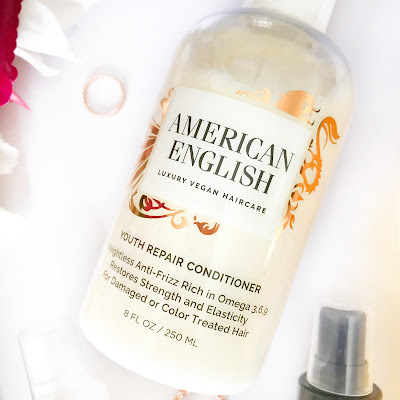 After using this, I've found that my hair is so much easier to blow-dry, as it makes it so sleek and soft, and actually decreases the time I have to spend blow-drying, which is a win-win situation as it means my hair is exposed to less heat damage (yay!). Once I've finished drying my hair, it's sooo much softer and shinier than it ever used to be, with virtually no frizz! I think out of all these gorgeous products, this one is my fave (and believe me, it was a tough choice!). As I said earlier, my hair is super frizzy, so anything that will tame the frizz is an essential for me. Again, this product smells so refreshing and it actually keeps my hair smelling amazing all day, which is the dream! I use this dry oil spray after using any sort of heat on my hair; so after blow-drying, straightening or even curling, to lock in the moisture and try to keep it looking sleek and free from frizz and static for as long as possible. This product is definitely a little miracle worker. My hair is kept smooth, sleek, frizz-free and amazingly shiny ALL DAY! I actually couldn't get over how well this little saviour works. If you have frizzy hair or just want to make your hair super soft and shiny all day, then this is something you definitely need to try. My mum has blonde hair which is very difficult to get looking shiny, but I used this on her and her hair actually looked shiny and super smooth! And there we have it! 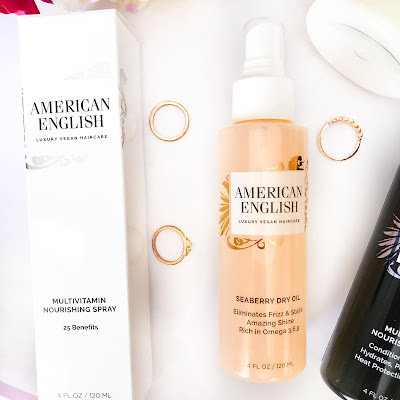 Overall, I absolutely adore these American English hair products and would recommend them to anyone to try. I'll be very surprised if you don't love them after just one use! And what's better than using products that will give you the hair you've always dreamed of, that are vegan too! I'll definitely be on the lookout for more American English goodies to try, as these have been the best things for my hair! Let me know what hair products you love using in the comments below! Disclaimer: these products were sent to me for reviewing purposes. All opinions are 100% my own. It's quite tricky to find good vegan hair products so thanks for sharing. I love vegan and natural hair products. These ones look really good. I love their packaging! These products look amazing. I really don't spend enough on haircare products and my hair definitely suffers as a result! The shampoo sounds great for me because I use heat on my hair almost everyday so that could really help me! Also the packaging of these products are gorgeous!! Ooo I've never heard of this brand, they sound lovely though, and the packaging is beautiful! The multivitamin nourishing spray sounds amazing! I've never heard of this brand before but they sound great. I absolutely love the packaging of these products too! I find it so hard to find vegan haircare, particularly luxury ones! This sounds like a perfect brand - love the packaging. These sound great, I like the sound of the oil and I've been looking for a good vegan brand! These haircare products really do look so luxurious. I haven't heard of this brand before. Gorgeous photos. Wow! I've never heard of this brand before so thanks for sharing! The packaging is beautiful, and good to know it works well on colour-treated hair, will definitely be checking these out.